Hear that sound? It's the "whirrrrrr" of a chainsaw, buzzing through the forest and the clear ocean air. But wait, there are no trees on this island: only 65 acres of bare rock and bird poop. So that sound must be a puffin, buried in its burrow on Seal Island National Wildlife Refuge, a little spot off the coast of Maine that gives rise to a booming colony of seabirds every summer. Puffins have a strong homing instinct, and each spring adults fly back to their birth site after spending the winter at sea. This year’s returning inhabitants are the descendants of seabird restoration efforts that date back to 1984. The island was desolate for decades until biologists relocated 1,000 chicks here from Newfoundland, Canada; by 1992, breeding pairs were once again nesting on the island. Convincing the first of the puffin pioneers to recolonize the island required numerous tricks, including decoys and playing recorded calls. Since 2012 the Seal Island web cams have offered viewers a front-row seat to the private lives of the inhabitants, and this year is no exception. 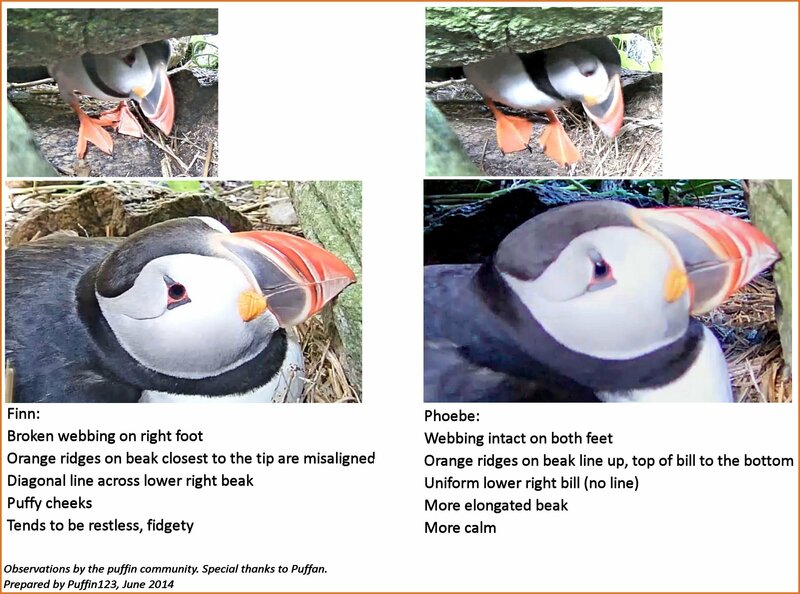 Three 24/7 live feeds are now available on explore.org: one offering a rare glimpse into the nesting burrow of a mating puffin pair (see below), another giving a view of the ledge outside the burrow, and the last zooming over the boulders and rock crevices around the sanctuary. The cameras are also capturing the antics of other avian species that live alongside the puffins, including Razorbills, Arctic Terns, and Black Guillemots. Here are some facts that you should know before you get sucked into the drama. Steve Kress, founder of Audubon’s Project Puffin and pioneer of seabird restoration, says the birds prefer not to rush into things. Kress says little is known about the mates’ romance out at sea. Even if the couple doesn’t migrate together, each spring they somehow find each other and pair up. Puffins usually make their burrows in protective rock crevasses, but they might also dig them into the soil. This is the third time that this pair, Phoebe and Finn, is known to have returned to Burrow 59, tucked among granite. Puffins are a rather conservative bunch. Phoebe and Finn are incubating one egg—the puffin norm. It may sound risky to put all reproductive hopes in one egg, but puffins invest an incredible amount of time and energy in each offspring, right from the shell stage. “Eggs require 20 percent of the female’s body weight and are bigger than an extra-large chicken egg. Puffins are only 10 inches tall, more like Bantam chickens,” says Kress. The birds also mate on the water, making it hard to determine a precise lay time. But they generally begin breeding in April, and this year’s egg was found on May 23. That means Phoebe and Finn’s chick ought to hatch date around early July. The unborn bird is already spurring friendly competition among humans. The Baby Pool—in which users predict the puffling’s birthday—has 23 bettors who stand to win serious bragging rights. There’s also a contest to name the pufflings, hopefully with more success than their parents. “Phoebe and Finn were named before they were sexed, but upon closer inspection Phoebe’s larger build and bill dimensions made him the father, not mother,” says Kress. There are other ways to pitch in. Viewers can help read the numbers on the pair’s leg bands to identify the individuals. The live feeds also have a snapshot feature (a clickable camera icon) that allow users to share special moments from the island. Kress also encourages users to leave their observations (date and time-labeled snapshots, queries, or remarks ) in the comment section to create a sort of dataset. “Right now we’re only monitoring things like feeding times, but this method could provide information on things we normally don’t, or can’t look at, like hatching,” says Kress. Any time is puffin time. Currently, there is no wrong time to tune into the puffin cams, says Kress. The feeds are buzzing with activity all throughout the day. “The couple is incubating for the next month or so; then we’re on pip watch,” he says, referring to the special fractures in the shell that the chick’s egg tooth is designed to chip through while hatching. Audubon will be covering the unfolding story of Phoebe and Finn (plus their soon-to-be, still-unnamed puffling). Check back to read more about their journey.